Tennessee fans stand at the end of the national anthem before the Orange and White spring football game at Neyland Stadium on Saturday. 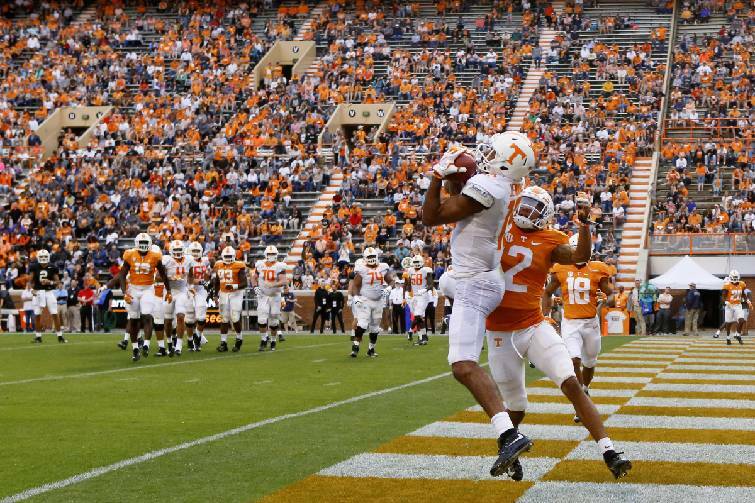 White team wide receiver Jauan Jennings pulls in a touchdown pass against Orange team defensive back Alontae Taylor during Tennessee's Orange and White spring football game Saturday evening at Neyland Stadium. 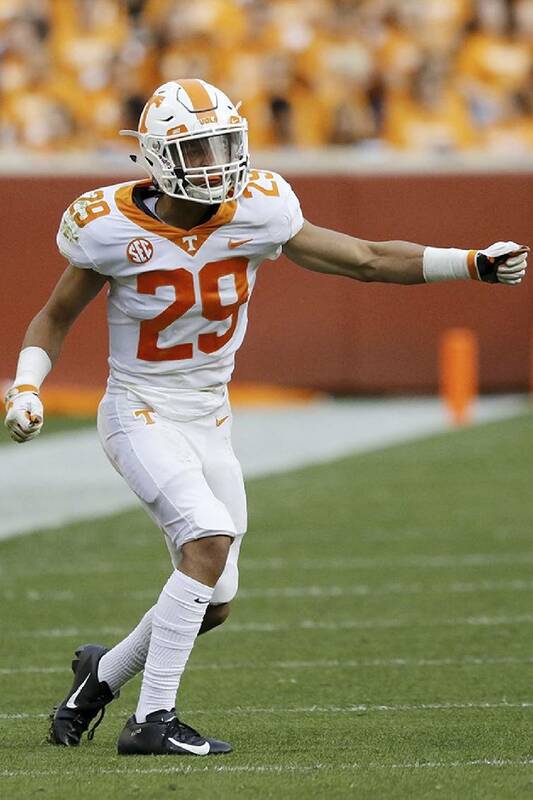 White team defensive back Brandon Davis celebrates after a tackle during the Orange and White spring football game at Neyland Stadium on Saturday. 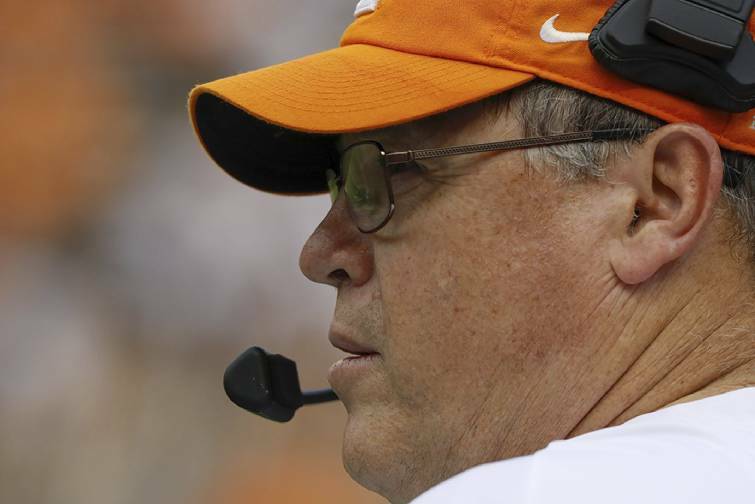 First-year Tennessee offensive coordinator Jim Chaney looks on during the Orange and White spring football game at Neyland Stadium on Saturday. White team quarterback Jarrett Guarantano sits on the bench during the Orange and White spring football game at Neyland Stadium on Saturday. 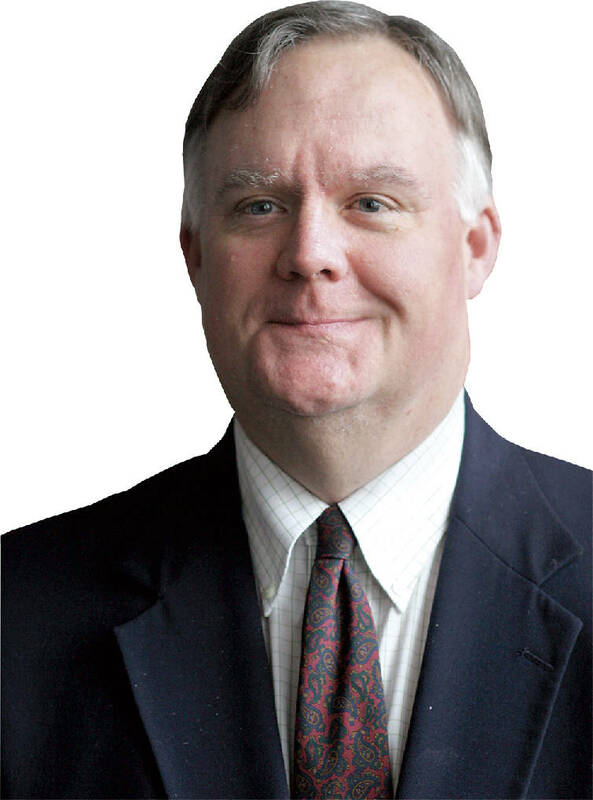 KNOXVILLE — And then Tiger Woods birdied No. 16 and the ground shook all the way to Neyland Stadium. Oops. Forgive me. If the ground shook in Neyland, it was surely because of the enthusiasm generated by the 2019 Chevrolet Orange & White Game, not some otherworldly golfing performance by His Stripeness at faraway Augusta National. 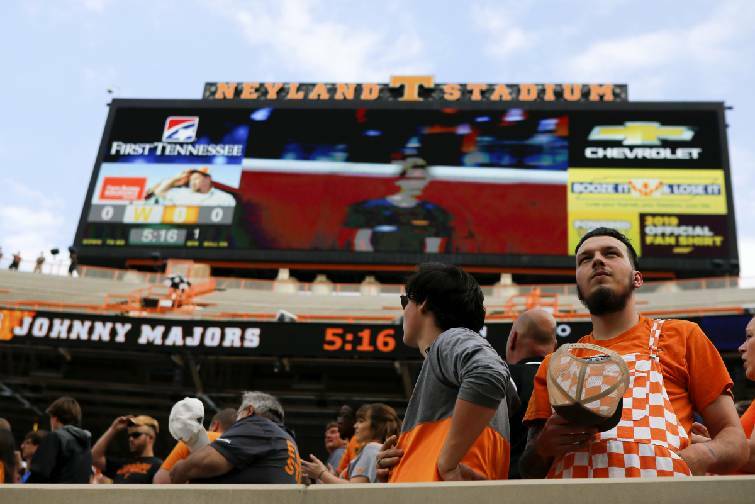 Maybe that enthusiasm was for redshirt junior quarterback Jarrett Guarantano, who threw four touchdowns and no interceptions in the University of Tennessee's spring football game. Maybe it was because the Volunteers' first-string defense actually looked pretty stout at times and the second-team defense — especially freshman defensive back Jaylen McCollough, who intercepted two passes — showed glimpses of playing the kind of defense second-year Vols head coach Jeremy Pruitt orchestrated as Alabama's defensive coordinator before he took over at Tennessee. Maybe it was because, in Pruitt's words: "There weren't near as many mental errors as we've had in previous practices." Or maybe it was because the generously estimated crowd of 50,967 was able to keep up with Tiger's Saturday charge at the Masters — as well as the Nashville Predators' overtime win over the Dallas Stars in the NHL playoffs — due to the magic of technology. Whatever the reason, much of that crowd was in line two hours before the 6 p.m. kickoff, and a good portion stayed until the fourth quarter. To be sure, no one in a UT football uniform looked likely to be a candidate for player of the year in the way UT men's basketball player Grant Williams finished second to Duke's Zion Williamson on Friday night in Wooden Award balloting. 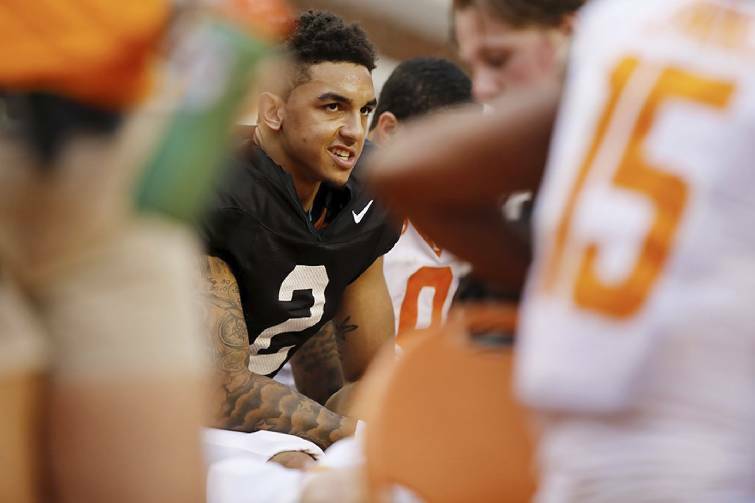 Guarantano already plans to "stay here in May and work with a couple of guys." Expect one of those guys to be Jauan Jennings, who caught five of Guarantano's passes for 57 yards and two touchdowns with a long of 31. This Jennings looked a lot like the one who broke Georgia's heart between the hedges three years ago on that Hail Mary pass from Josh Dobbs, who was on the Neyland sidelines on Saturday. This Jennings, along with Josh Palmer (three catches for 25 yards and one touchdown) and Marquez Callaway (two catches for 61 yards) is what led Pruitt to observe: "We've got playmakers at wide receiver and we need to keep the ball in play." They also need to find more running lanes for slippery running backs Tom Jordan (eight carries for 39 yards) and Ty Chandler (seven for 32). Again, Pruitt: "Really got to shore up our offensive line up front." But if this team looked better than the Vols did in every game last year other than a surprising road win at ranked Auburn and an overwhelming home win over ranked Kentucky, it might be because Pruitt knows what he's doing, especially with the offseason hire of former Georgia assistant Jim Chaney as offensive coordinator. Chaney, of course, is the only undefeated head coach in Vols football history, thanks to his victory over Kentucky in 2012, when he served as interim head coach after the dismissal of Derek Dooley with one game to play in that regular season. Guarantano said Chaney's second stint as the Vols' OC shouldn't take long to enjoy. Asked about what's different for the Big Orange offense compared to this time a year ago, the quarterback said: "The way Coach Chaney calls plays is different. More explosive plays. Throwing the ball downfield." Indeed, five pass completions covered 10 or more yard, and three went for 20 or more. "I think all of our receivers have had very good springs," Guarantano added. Obviously, this wasn't Alabama or Georgia or Florida in the Swamp that the Vols' offense shined against on Saturday. There's a reason why UT has posted losing records the past two seasons and three of the past six. However disappointing a 6-6 record might be to some Volniacs, a bowl bid, any bowl bid, could do wonders for this program going forward, however meager that bowl's profile. There's also this from UT linebacker Daniel Bituli, whom Pruitt named the spring's most improved player on defense (Palmer won it on offense.) Asked about how much of Pruitt's highly respected defensive system was on display in the spring game, Bituli replied, "Very vanilla today." Just as well. On this weekend above all others, it's best to leave the truly groundshaking stuff to all those guys fighting to win the green jacket at Augusta National.